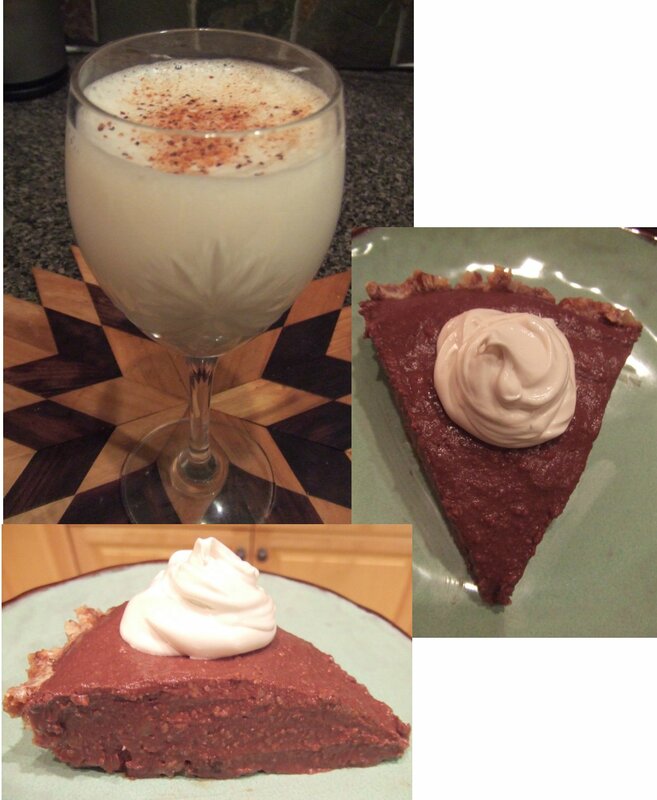 True to my motto “Life is short, eat desert first!”, here are 2 sweet treats for Christmas. Soy Nog, is an eggless and dairy-free version everyone, young and old can indulge guilt-free. For one, you avoid the whole raw egg and salmonella poisoning ordeal! Who would want that and it would kind of ruin your Christmas holidays! Soy nog is also much lighter before or after a big meal. Unlike its original counterpart, young and old can safely drink it, no alcohol, low fat, low cholesterol, what’s not to like?Plus, it is a no brainer. You can make a rich version or a lighter version depending on the meal you are serving or the occasion. And who said that you can only have it around Christmas? Pour into nice cups and sprinkle with nutmeg. What is better than a no bake dessert after a rich meal? This recipe is by no mean an original one, because I have seen many different versions going around. A cross between a cheesecake and a chocolate mousse, this is a treat for chocolate lovers. Save on electricity too since you only need to refrigerate it! Every bit counts these days! Pulse the nuts, dates and oats in a food processor a few times until finely chopped. Then add the vegan butter or coconut oil and sugar, pulse again. Start by melting the chocolate chips in a double boiler. You don’t need a fancy pan. I just use a smaller pan that I insert into a larger one that I filled with some water. That’s it. This way, you save on space and money, what a deal! NOTE: Don’t ever use a microwave! If you knew and could see what it does to the food, you would remove it altogether from your kitchen (that’s what I did).You don’t have to take my word for it, there is plenty of information online, people just don’t know (http://www.relfe.com/microwave.html). Add the water to get a smooth cream, then add the agave tofu, vanilla, orange peel and blend. Add the melted chocolate in batches until well mixed. Pour the filling into the crust, smoothing the top. Refrigerate overnight or at least 3 hours. This pie is great with herbal tea or chai tea. Stay warm and dry, depending where you live!